Restarting LITTLE FREE ART GALLERY project. Little Free Art Gallery No. 1 portable/mobile demonstration unit construction has begun. Seek partners interested in participating and integrating this project in appropriate community settings. "Free" as in "no money"
Some of us pick up discarded things and make art from them. Daniel Suelo makes a life that way…a life that amounts to a work of art, don't you think? BUMPER STICKER: "My other car is a '49 Rolling Free Art Gallery!" 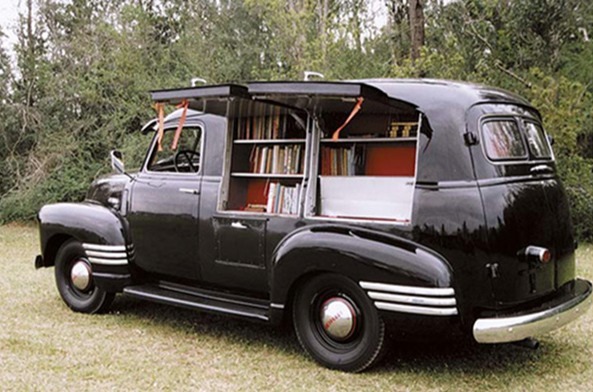 We can use the '49 Chevy Rolling Free Art Gallery to deliver Little Free Art Galleries (that will in turn disseminate little free signed, original works of art from participating artists) for on-the-spot art interventions where needed… Won't you climb on board for the ride? Which is Art? Which is Junk? Why? The Art Works page presents a curated archive of up-to-date information about original art works distributed via Little Free Art Galleries to date, newest exhibits listed first. (Links to individual artist and art work pages will come later, after the list of works grows too long.) The information in the Art Works archive comes from by Little Free Art Gallery owners and installation curators via the LittleFreeArtGallery.com blog, and other sources. I’m an artist (part-time, with a day job) now, but in a previous life I was a librarian - and I still spend any time left over from my job and my artwork reading books books books. 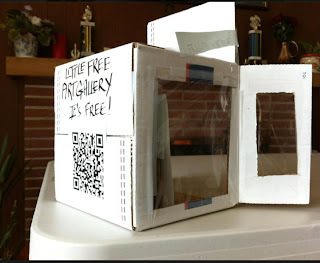 So back in March, when I saw a posting on Facebook for the Little Free Library , my first thought - oh, cool -- scattered personal small libraries where you can just pick up a book, leave one off .. My second thought was, well - how about a little free art gallery? I do sell my original artwork and crafts, but I also give a lot of it away, and I loved the idea of freely sharing small pieces with people who would give my art a good home. A natural fit would be artist trading cards, which are miniature works of art, only 2 ½ X 3 ½ inches (63 mm X 89 mm) and are traded or exchanged, but not meant to be sold. This is an artist trading card I made using lutradur on which I printed a double exposure photograph that I took of myself some years ago. My goals are to inspire: inspire others to enjoy, appreciate and value art, to make their own original art, to share art pieces freely, to collaborate on art projects with friends and neighbors, to foster community … and much more! I’m a photo-based artist. I use my original nature photographs as a leaping-off point for my images and designs. So for my first Little Free Art Gallery, I am decorating a small plain birdhouse that I will fill with some of my artwork (bird-related, perhaps? ), and hang it from a tree in front of our house. Stay tuned for photos of my progress and the Gallery when it’s in place! Ideal for indoor give-away installations, on the counter next to a cash register for example. (Photos by Doug Millison). 1. Is it Art because somebody is willing to pay for it? 2. Is it not Art if an artist gives it away for free? …because the project helps us realize to what extent some of us take those skills, insights, and accomplishments to high levels that are worth rewarding when we purchase art. …because this project has the potential to attract new patrons and followers for the artists and organizations that take part, and can lead to increased sales or other incrementally positive business outcomes for them, not to mention the creative glory of it all. Front view of XXXS Little Free Art Gallery prototype made from an upcycled gift box approximately 3 inches wide, 5 inches tall, 1 inch wide with prototype "FREE ART" signed original art work installed. This XXXS Gallery prototype is designed for indoor distribution; it is not weatherproof. XXXS Little Free Art Gallery prototype, verso, made from an upcycled gift box approximately 3 inches wide, 5 inches tall, 1 inch wide with prototype "FREE ART" signed original art work installed on the opposite side of the box, not visible in this photo. 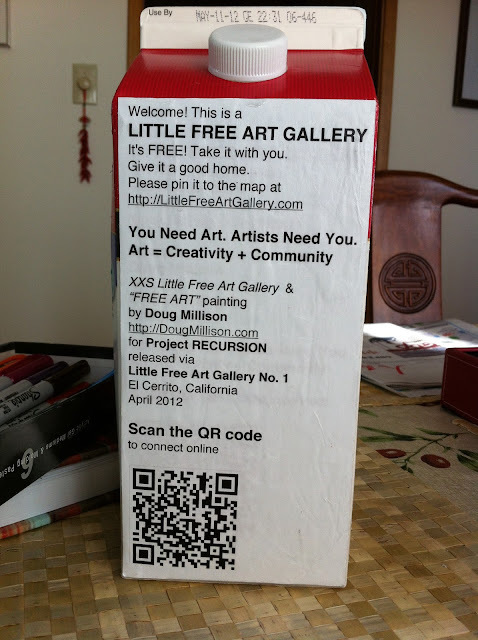 XXS "Single-Serving Size" Little Free Art Gallery Milk Carton Prototype for Project "FREE ART"
We invite artists of all ages and skill levels, amateurs and professionals, to participate in Little Free Art Gallery's inaugural activity, Project “FREE ART”. We also seek and invite Web developers and people with finish carpentry and crafts skills to help build the Full-Size Little Free Art Gallery kiosks that will form the project spine. Participating artists are invited to contribute art works to distribute to the public for free from existing Little Free Art Gallery installations. The public will be invited to participate in Project "FREE ART" by gathering clues at participating partner locations, using social media online check-ins on smartphones & tablets and QR code scanning to connect to the project Web site. Clues lead participants to Little Free Art Gallery installations. Each full-size Little Free Art Gallery distributes miniature XXS "Single-Serving Size" Little Free Art Galleries each created and contributed by a participating artist, and other small, original, signed works of art. 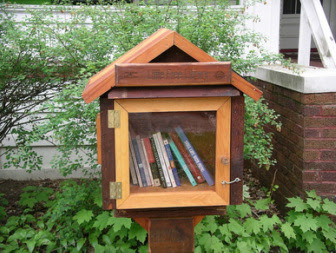 A full-size Little Free Art Gallery might look something like this Little Free Library (image from http://www.littlefreelibrary.org), designed to distribute small works of art instead of books. They can be installed in a variety of public and open-to-the-public locations including art studios, galleries, museums, stores that sell art supplies and tools or which cater to art-lovers, schools, hospitals, etc. – anywhere that art-lovers might enjoy encountering them and helping themselves to an original work of art for FREE. Little Free Art Gallery kiosks and the art works they distribute, are made of recycled/upcycled materials; the project encourages the development of green, sustainable art studio, installation, manufacturing, distribution, and presentation practices. Little Free Art Gallery No.1 and others now under development at undisclosed locations in Emeryville and El Cerrito, California and elsewhere. No 1. is 3’ wide, 2’ high, 2’ deep, capable of distributing multiple smaller works of art including XXS "Single-Serving Size" Little Free Art Galleries for the full, recursive art experience. Full-size Little Free Art Galleries designed to be weatherproof and to withstand the rigors of a public existence may seem daunting to build, but even a young child with proper supervision can craft an XS "Single-Serving Size" 1-gallon Milk Carton or XXS 1/2 gallon Milk Carton which are moderately weatherproof and can last outdoors long enough for an activity like Project "FREE ART". If the kiosks are to be used indoors where weather and security are not a problem, children can make even a Full-size Little Free Art Gallery, as well as smaller "Single-Serving" size units from cardboard boxes, foam, and other common craft materials. http://LittleFreeArtGallery.com/ will curate and publish a directory to Project "FREE ART" installations and artists, at http://Little/ Free Art Gallery.com, as an ebook, and as a printed book via print-on-demand. XXS "Single-Serving Size" Little Free Art Gallery prototypes have been made from a half-gallon milk carton, an 8-inch USPS shipping box, and a 3" X 5" X 1" upcycled gift box. Project artists are free to experiment with original designs for full-size and XXS galleries. Each XXS "Single-Serving Size" Little Free Art Gallery presents a small, original, framed work of art (painting, drawing, calligraphy, sculpture, collage, etc. ), signed by the artist. The art work may also include a digital component (DVD, USB drive, etc.) that delivers digital art, but not to substitute for the physical art work. You need art. Artists need you. Art = Creativity + Community. QR codes link full-size and XXS Little Free Art Galleries and individual “FREE ART” pieces to online landing pages that explain the project, provide information about and links to the participating artists, and let the recipient pin the art work to the online map and take part in the discussion and other activities there. Gallery windows in opposite side of the carton and in each sidewall. "FREE ART" signed original painting installed inside, as described in the also-under-development Project: RECURSION design document. This and other XXS Little Free Art Gallery boxes each including "FREE ART" signed original painting, will be distributed for free from the full-size Little Free Art Gallery No. 1 now in development for installation at the El Cerrito, California test site. Landing page for QR scan also under development. There, the person who takes the XXS Little Free Art Gallery box connects with the project and pins the location of the art's new home to the project map. Public invited to participate in the project by gathering clues at participating partner locations, using social media online check-ins on smartphones & tablets and QR code scanning to connect to the project Web site. Clues lead to Little Free Art Gallery installations. 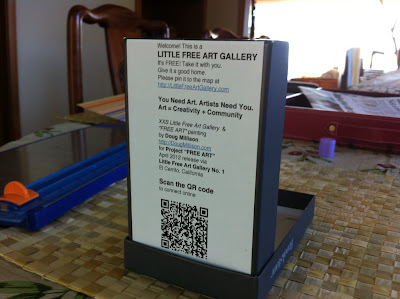 Each full-size Little Free Art Gallery (No.1 in El Cerrito is 3’ wide, 2’ high, 2’ deep) distributes miniature XXS Little Free Art Galleries each created and contributed by a participating artist. 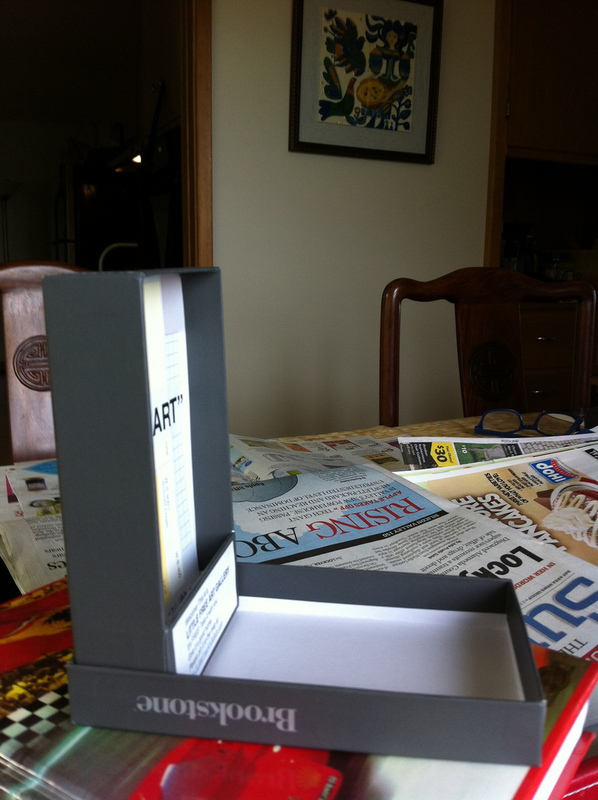 Current XXS Little Free Art Gallery prototypes are the size of half-gallon milk carton and an 8-inch USPS shipping box. Some artists may choose to create distribute additional XXS Little Free Art Galleries and place them in diverse locations where participants can find them. 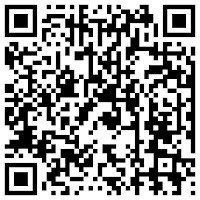 QR code links full-size and XXS Little Free Art Galleries and individual “FREE ART” paintings to landing pages that explain the project, provide information about and links to the participating artists, and let the recipient pin the art work to the online map and take part in the discussion and other activities there. Struggling to find readers, small East Bay presses put together an art exhibit of their overstock at the Berkeley Art Museum. Authors who have been published by major publishing houses know that the lifespan of their book is almost always short and tragic. "For larger publishers, some books will come out on a Monday, and by Friday, they'll be out of print and dead," said Brent Cunningham, operations director of Small Press Distribution, the only distributor in the country dedicated exclusively to independently published literature. At small presses like the ones Cunningham works with, the profit motive is smaller and the books live longer. But that doesn't necessarily mean anyone is going to buy them. In many cases, the books become furniture, or potentially collapsing safety hazards. "Our books could take up a few football fields," Cunningham said. That's what happens when you love books too much: You can't get rid of them. This became a serious problem for Berkeley's Kelsey Street Press. Ramsay Bell Breslin, one of Kelsey Street's editors, knew the press had to either throw away the overstocked books or pay $60 a month to store them. The latter option was complicated by the fact that funding sources had dried up after the publisher lost its nonprofit status. editors, said the press with faced with destroying the overstock of books or paying $60 a month to store them. 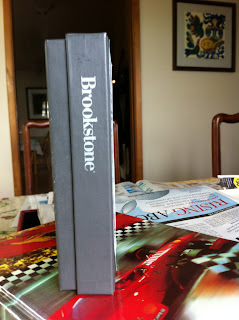 Then, while going through a pile of books one day, Breslin couldn't help but admire the texture of the hardcovers, the smell of the pages, and the inclusive nature of the book spine. Kelsey Street Press may be releasing its first e-book later this year, but Breslin, like many bibliophiles, still has a thing for the physical presence of books. "Books have always felt like art to me," Breslin said. 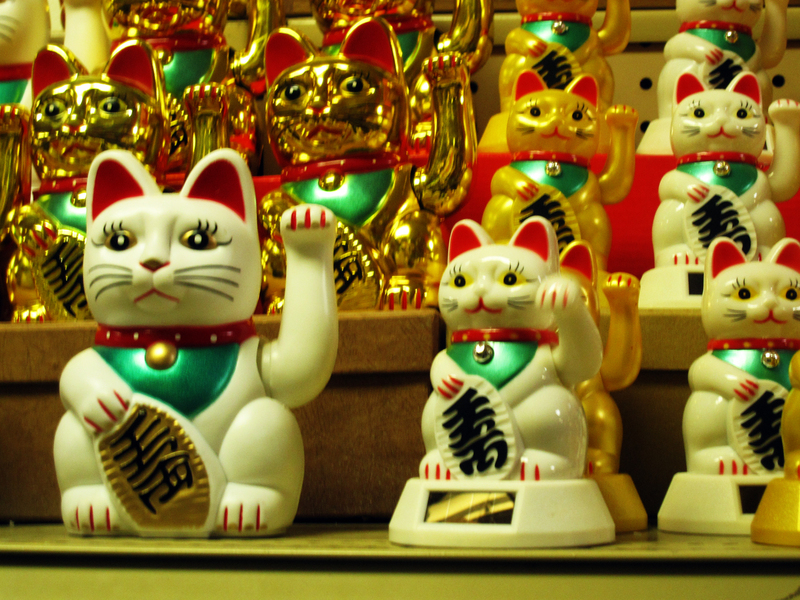 "I've always thought of them as objects. It always made sense to me that they should be displayed in a museum." 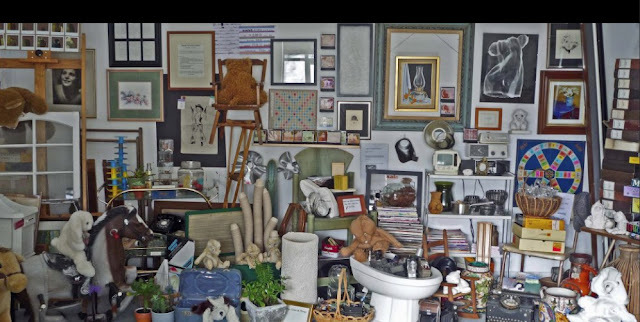 So last fall Breslin started working with Lawrence Rinder, the director of the Berkeley Art Museum and Pacific Film Archive, to create an art exhibit out of her overstock. The idea was to solve a financial problem by highlighting the physical appeal of books from local presses in the East Bay. Rinder loved the idea. "Museums are asking the same questions bookstores are," he said. "I mean, why go to a museum if you can just look at pictures online in high resolution? It's about the experience." Dubbed "The Reading Room" and curated by Breslin, the exhibit opened in mid-January and runs through June 17. It resides in the museum's lobby and features poetry and experimental fiction from local publishers like Kelsey Street Press, Atelos Books, and Tuumba Press. On the surface, it looks like an old-fashioned bookstore: there are several bookcases, two giant cozy chairs, a blanket for snuggling, and reading lamps that hang from the shelves. Actually, said Breslin, The Reading Room is a book in and of itself. "You can read it from left to right," she explained, walking through the exhibit one recent day. "On the first shelf, the books face forward," she said. "On the next shelf, the same books are facing backwards." Then we came across books that were not yet born — their covers were laid out flat. "These are book flats, with no spines, before they've been printed," she said. Some books appear multiple times, creating a syncopating rhythm. Other books are organized by size or by color, forming a rainbow. Overhead, through speakers, the quiet voices of poets reading play. Breslin said her goal was to create a sense of quietude, "as opposed to that enforced library silence." The temptation to grab the blanket and read a book for the rest of the day was powerful. But the books themselves are not so easy to tackle. Many are experimental, or genre-bending. Poetical Dictionary by Lohren Green, for example, is written as though it were a dictionary and fiction, all at once. Perhaps that's the point of The Reading Room: to force people to be brave and discover new books they might otherwise overlook. To further encourage discovery, the museum instituted a "take a book, leave a book" policy. Initially, this element concerned some authors, who worried that giving away their books for free would give readers the impression that they're not of value. But Cunningham, who contributed some books from Small Press Distribution to the exhibit, believed this would be offset by the potential to engage new readers. "We're hoping that it'll be like a gateway drug for small presses," he said. "People will get one experimental book they wouldn't normally read, and become addicted." The sharing aspect also adds a dynamic angle to the exhibit. Museum-goers have left everything from children's books to homemade 'zines on the shelves. "The Reading Room is about experiencing books," said Rinder. "It's a shared conversation. If someone takes a book, the exhibit changes completely." Naturally, a reading series seemed an appropriate accompaniment to The Reading Room exhibit. RE@DS, hosted by poet/author David Brazil and poet/publisher/SFMOMA community producer Suzanne Stein, invites young poets to give a reading that incorporates multimedia elements, just as The Reading Room incorporates both the museum landscape and poetry. "The readers have complete creative freedom," said Stein, "except with some limitations presented by budgets and safety." In one performance, San Francisco poet Christian Nagler invited the audience to do calisthenics while he gave a lecture on the economics of equity. In another, poet Tom Comitta led the audience in a "guerrilla opera," which entailed singing from a book of poetry for forty minutes. "Everyone participates," said Comitta. "Even if you aren't doing anything, people will notice that, too. You can play with a person you've never met before, or you can sit alone in a corner." At Brian Ang's reading on March 23, the scene was as serious, intellectual, and literary as can be. When Brazil introduced Ang as the night's reader, Ang did not stand up and rise to the front of the room as expected. Instead, a composition by multi-instrumentalist Anthony Braxton played for a few minutes. Some members of the audience closed their eyes; others fidgeted, texted, or read from Occupation Treatment, the free book by Taylor Brady that had been left on everyone's chairs. After describing his collection of poetry, Pre-symbolic, as the "most encyclopedic collection of poetry ever written," Ang read some poems: "Onset of mechanical reproduction transformation/Haphazard administrative visible imagined/incorporated morphology aesthetics/Metaphysical greasepaint/Generations of science theory." The Reading Room isn't the only East Bay exhibit melding books with art. Pictures + Words, a new artist series at the Bay Area Free Book Exchange that runs through July, invites artists Philip King, Michelle Wilson, and Timothy Buckwalter to use pages from books to create narratives in ways typically associated with literature. "I love books, don't get me wrong," said Wilson. "But sometimes text locks the story in. I'm interested in creating a story without doing that." The pages, which Wilson made, will not be displayed in order, forcing readers to make up their own stories. Inspired by The Reading Room, Small Press Distribution is also hosting a reading series and book giveaway on April 30, the last day of National Poetry Month. While reading series usually entail people reading out loud, in this series poets will read silently, in their heads, which you can watch, if you'd like. Or you can just grab a book and run. The old rules of what can and cannot be done with books have, it seems, vanished. If somebody will pay a lot of $ for it, does that make it Art? Kinkade: Home decorator, kitsch-master, or artist? "Artists hide free art around Detroit"
Otis the dog pictured with some free art discovered by a participant. Free Art Friday Detroit is part of Detroit’s ever-solidifying artistic community. The idea is simple: artists of any kind create a custom piece of art — from paintings to sculptures, and anything in between — and hide it somewhere in Detroit. The artists post a photo on Facebook and Twitter of the place where they dropped it as a clue. Anyone who finds the art is free to keep it; however, FAFDET asks that the finder post a photo of the discovered art on a social networking site. From just a couple of art pieces in January to almost 20 by March 23, FAFDET is seeing terrific growth in participation, as well as drop locations. While most of the drops are still in the Midtown and Downtown areas, art has been left in Corktown, New Center and even on Belle Isle. Branch while walking his dog, Otis. TJ Samuels of Bloomfield Hills emphasizes the same thing. He likes that FAFDET allows people to explore Detroit, adding that it gives people already in the city a reason to look at it differently. Last Friday, I decided to try out Free Art Friday myself. At around noon, I grabbed the three photographs I’d be scattering in the city, my bicycle and my winter coat. I pedaled down Cass Avenue as the rain turned into hail. I hadn’t passed Alexandrine and I was soaking wet. After making it downtown, I considered places where I could hide my photos. Even though they were in plastic sleeves, I did not want them to be left uncovered. One went by the Detroit People Mover’s Times Square station. I placed another in a newspaper stand near Harmonie Park, and dropped the final photo outside of the Detroit Opera House. Aside from being able to share my work with others, I thought the best part of FAFDET was trying to find the work of others. The social media aspect of Free Art Friday allows you to go on your phone and keep up with any updates on Facebook or Twitter. While seeking cover at the Rosa Parks Transit Center, I felt engaged with the process the entire time — it was exciting. After searching some places where art had been left, I realized they had all been found. I headed back to Wayne State without any art, or feeling in my fingers and toes. However, I did come back with great satisfaction, a sense of accomplishment and the hope that next Friday is a little dryer. For more information on how to participate, visit www.facebook.com/FAFDET. Great minds think alike! Add food, music, arts & crafts demonstrations/DIY and this adds up to a concept similar to the SF Bay Area Free Art Exchange that Doug Millison started thinking and writing about earlier this year, https://docs.google.com/document/d/1x9TV5Sb2-14Vse3f_VB78NZprxEjeW73muB-KkmDjD0/edit, which sprouted the Little Free Art Gallery concept with Heidi Rand. 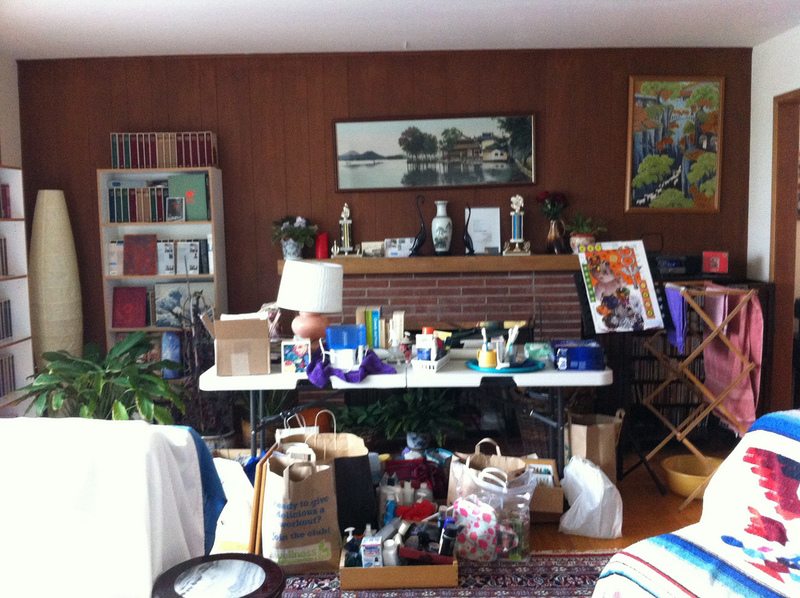 …In order for my projects to be successful I need you to come in and take whatever you want. I arrange these active, social installations with you in mind. I have art supplies and art (art by me, art by others); new stuff and very old stuff; collectibles and collections; plants, cameras, furniture; nostalgia, melancholy, memories, generosity and greed, but good greed, not that bad kind of greed...but don't be too greedy, there's plenty for everyone. I have been accumulating for the last 2 years and most has been gleaned free or through alternative means from Craigslist, eBay, and friends. I am keeping a journal, online and in print, of my experiences while collecting, images of the things I am offering, the stories from the people who gave. If (when) you find something you would like I can tell you some part of its story, either the story of how it was obtained or the story of its people, so ask me, I'm right here. 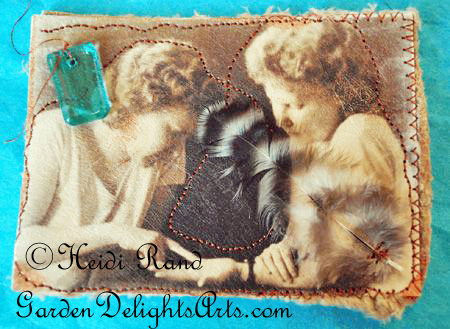 Every object has a story, a past, maybe some ghosts and I'm happy to share. I believe there really is something for everyone. I ask all of you to embrace the dance between choices and possibilities. Some of you will jump in with glee, and I thank you for your enthusiasm; some of you will be more hesitant and I just ask that you please forget your constraints, let go of any inhibitions, be they social or economic, forget the stigma of free. Get in there! Indulge yourself in the experience of being allowed to touch and take stuff in a gallery/museum, normally taboo but now expected and encouraged. I hope you take something, I want you to take something. And while you are there consider the possibilities of a utopian free economy that bypasses monetary exchange. Crazy, I know. Think about the abundance of things and the ecological impact of passing along instead of throwing away; receiving rather than purchasing. Consider the value of things, the value of art, art materials, objects - the value of memories, sentimentality and stories. Pass it on, pay it forward. Give free, get free. Cool right? April 28, 2012 through May something. 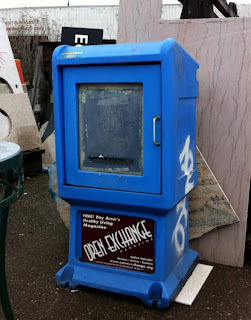 A recycled newspaper dispensing box, adapted as Little Free Art Gallery might be interesting. What kind of art works are available for free in a Little Free Art Gallery? Collage by Doug Millison, found/altered digital objects + Virgin Mary tattoo by Srayla Tip. As you look at this image, recall that you are enjoying a FREE original art experience, the artist has provided it to you at no cost. Special versions/installations to handle larger art works. Why Little Free Art Gallery? Why now? Bali is often described as a culture that celebrates art as a part of daily life, without separating it from the rest of society, behind museum gates and gallery security -- but a stroll through Facebook tells me that we do that here in the USA, too. Facebook, Etsy, and other popular online social networks show ever-increasing numbers of people who make and share/sell art online, people who view/purchase art and share media related to art, plus numerous categories of commercial and non-profit organizations that serve art-lovers and artists, offer instruction in the arts, & etc. We see huge numbers - always increasing - of us creating and sharing art; some of us avoid the A-word and say “crafts”. A whole culture of artistic creation and sharing, and buying/selling, has sprung up on the Web, in places like Facebook, Etsy, etc. -- apart from the traditional art school/gallery/museum circuit that traditionally develops and houses and other wise sells or distributes Art. Little Free Art Gallery is part of this new movement of people developing their creative abilities, making and sharing art, as part of fabric of their daily lives and social activities, outside the traditional circle of artists, curators, brokers, and art institutions. Maybe not everybody is compensated like a celebrity artist, but everybody is an artist. Art-lovers need art and to interact with artists. Interaction between artists and art-lovers builds community and fosters creativity. 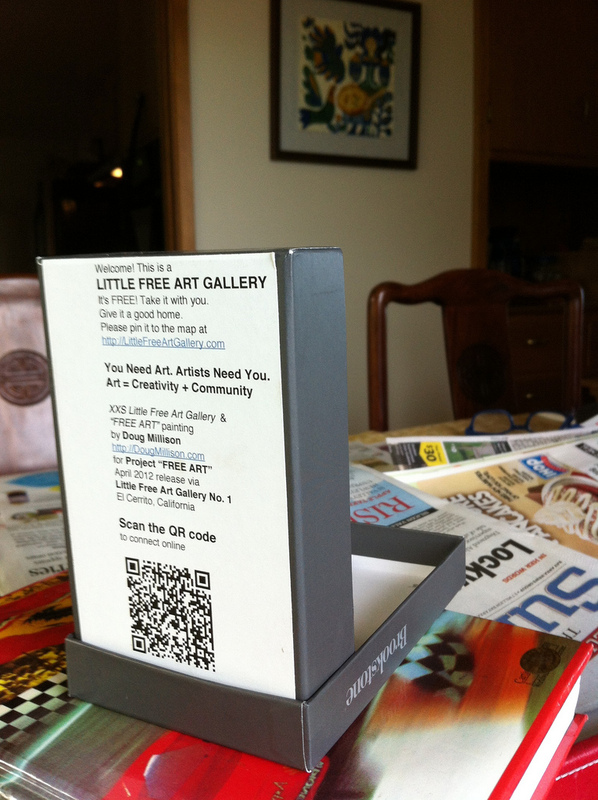 Little Free Art Gallery facilitates direct interaction between artists and art-lovers. Little Free Art Gallery serves to bring artists and audiences together, in places where people may not always automatically think of themselves in those terms, aiming to expand the creative circle so more people can enjoy making, interacting with, and sharing art. 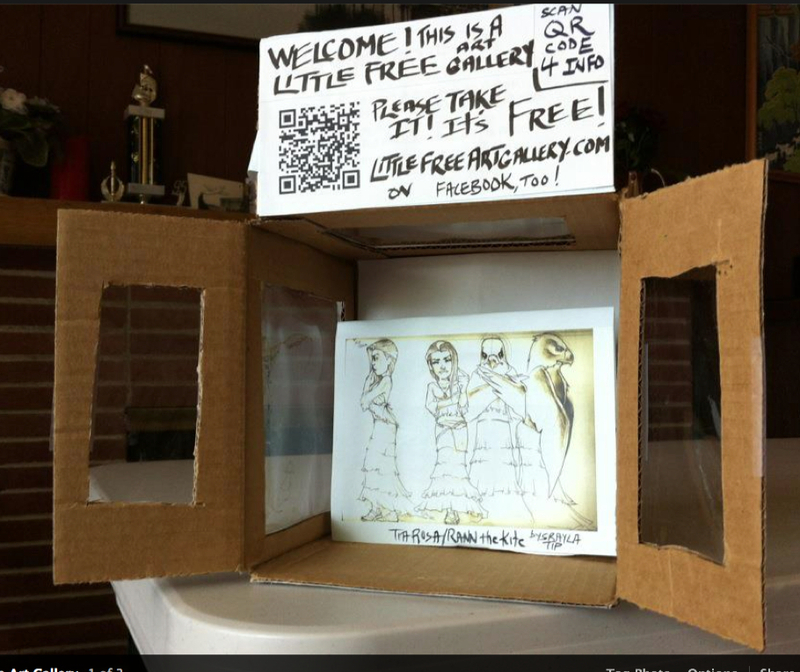 The Little Free Art Gallery project is an art work itself. The display/exchange box is an art object, designed by an artist, as well as the individual art works displayed within. The interaction between a person and a Little Free Art Gallery amounts to a conceptual art performance that can be scripted in advance to a certain degree, and which can be streamed to online audiences, and recorded for later viewing or other artistic use. Signage can educate re: the project -- What's this All About? 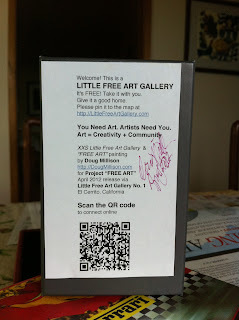 -- and give instructions, How to Use this Little Free Art Gallery; reading it should be entertaining for the visitor. 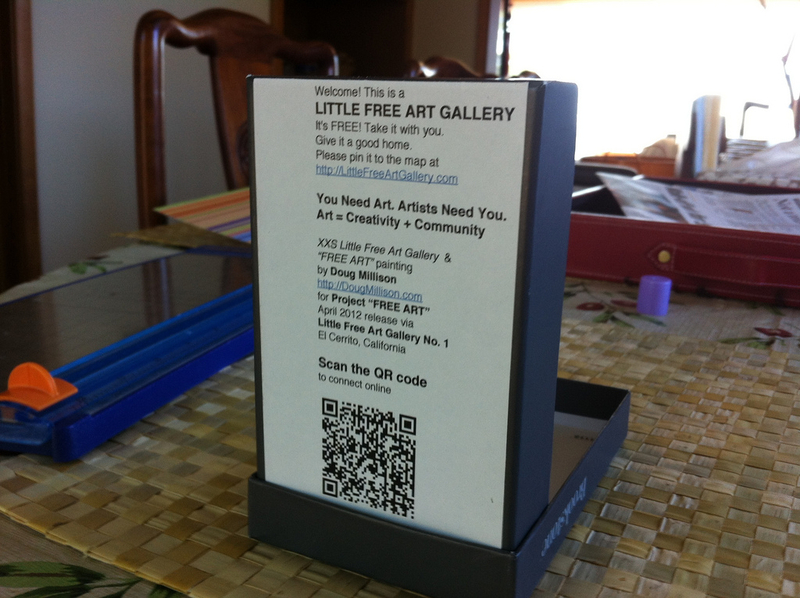 QR codes and urls in the Little Free Art Gallery box and on the individual works of art displayed therein, send smartphone and tablet/portable computer users visitors down multiple activity paths as they connect online with whatever resources the artists and organizers have waiting for them on the Web. A high-tech installation could be rigged to play music/sound/speech and display video on a screen, when the door is opened, or by some other triggering event(s) as a person approaches the Little Free Art Gallery. If the box includes a web cam, the whole interaction of visitor and art can be recorded (for later viewing or other artistic re-purposing) and streamed online. Little Free Art Gallery thus examines the relationships between artists, art-lovers, and the art marketplace, in an effort to understand what constitutes “value” in a work of art, what a work is “worth”, and who should be able to own one. The project also addresses the issue of how artists are compensated for their work in a world where people expect to get all media, "art" included, for free by sharing on Facebook, Twitter, Pinterest, Tumblr, etc. & etc., where they need many very good reasons to spend real money on any kind of media experience and don’t often spend any on “Art”. In a series of Little Free Art Gallery installations placed in a variety of settings freely open to the public in communities around the world, artists invite people to engage with their art works in and take possession of an original work of art, for free, at no cost. The project thus serves to subvert popular conceptions of Art and Artists as remote and inaccessible due to cost or distance, and somehow separated from the ordinary people of the community involved in daily life, work, amusements. At the same time, the project connects art-lovers to specific artists; they can move on to purchase works of art from the artist and otherwise support their work by attending future art shows & etc. An extra-small version, made of recycled materials (to keep cash cost low-to-no), just big enough to contain a single art work + label with brief info about the project + QR code link to project web site. After an initial network of permanent Little Free Art Gallery kiosks is installed (no matter how few nodes, more than 1 is a network! ), the participating artists could make some of these XXS Little Free Art Gallery boxes and put them out in public in locations where art lovers have a chance of encountering them. As such, making and placing these little boxes out and about, may enter the sphere of outlaw street art, or the XXS Little Free Art Gallery installations could be sanctioned. Teaser photographs and videos of these XXS boxes and the process of installing them would be shared on the project blog as well as in social media (Flickr, Facebook, Twitter, Pinterest, Tumblr, etc.). Plus an out-bound public relations effort to get news of the project to interested journalists and bloggers so they can in turn write about it for their audiences. These single-serving Little Free Art Gallery boxes each with 1 art work inside, could also be a product that the project markets and sells (from the project web site and via a variety of online and other distribution channels), in addition to t-shirts, caps, and other merchandise carrying the Little Free Art Gallery project logo. Last weekend during the New York art fairs, Occupy Museums reminded attendees of the Armory Show that having a big bank account wasn’t the only way to obtain the art. The Free Art Gallery is an ongoing art project consisting in providing art completely free of charge. Works available are non-editioned, one-of-a-kind pieces and are completely free of charge without any other sort of strings attached. Because of the high volume of requests, interested viewers are only asked to fill out a simple form requesting a particular work or works, explaining the reasons for their interest. When more than one viewer is interested in a work, one request will be favored over the other based on an asessment of the viewer’s degree of sincere interest in the work. TFAG does not discriminate in terms of social hierarchy or influence. The project was first presented at the Armory Art fair in New York in March 2008, and later at Mexico City’s art fair FEMACO in that same year. 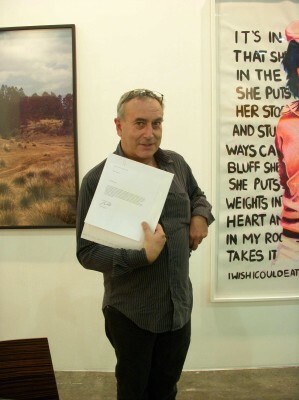 In addition, certan works were given to specific individuals from the art world, including artists, critics, curators, and others, with a letter stipulating that they were free to do as they pleased with the free work, and should they return it back to the gallery it would be immediately destroyed. Note: All feedback welcome. The project vision continues to evolve, with issues yet to clarify and challenges to overcome. To promote art making and the love of art by building free art exchanges worldwide. To build a sense of community and deepen our understanding of the world around us, as we inspire and help each other to make and share art. What is the Little Free Art Gallery Project? Locally, it is a grassroots movement that spreads by word of mouth as one then another person chooses to install a Little Free Art Gallery and use it to distribute original works of art for free in the neighborhood or community. Globally, it is a Web-based membership organization for artists and art lovers, free to all to join and use. On the Web, Little Free Art Gallery Project tracks which works of art have been donated by which artists, following them (on the project blog and map; via email follow-up, or by tracking RFID and/or QR code tags on the art work) to see where they go: stories to be shared online. The Little Free Art Gallery Project can also download/stream new art works, video, and other digital media, to Web-connected Little Free Art Gallery kiosks equipped to present digital interactive multimedia art experiences. 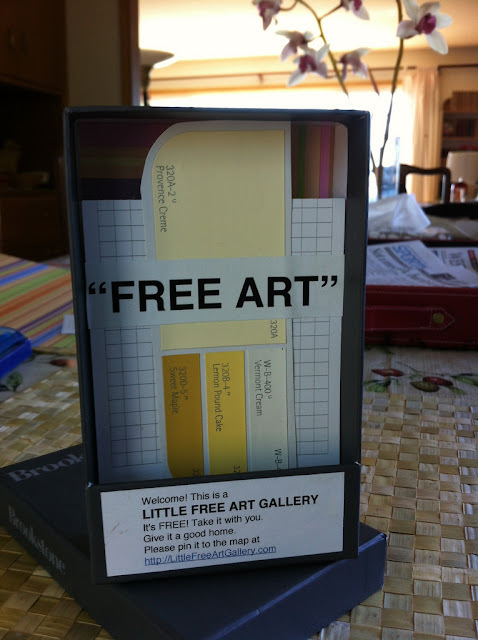 What is a Little Free Art Gallery? A Little Free Art Gallery is a box (weatherproof if installed outdoors) with one or more windows and a door that viewers can open, where artists exhibit original works that they intend to give for free to any art-lover who wants to take it. The art works can be physical, digital, or both, depending on the capabilities of the installation. Properly equipped and integrated to the Internet, Little Free Art Gallery serves as node and waystation in a global free art exchange network that connects artists and art-lovers in an ever-expanding creative sharing circle. Little Free Art Gallery installations serve as sites where artists and art lovers interact and foster community-building and the spread of creative skills through the free exchange of art. Can a Little Free Art Gallery sell art works as well as give them away? With the addition of a key pad for password entry, a Little Free Art Gallery becomes, in effect, an art vending machine, to distribute free or paid works of art. 3. Receive key pad password code. 5. 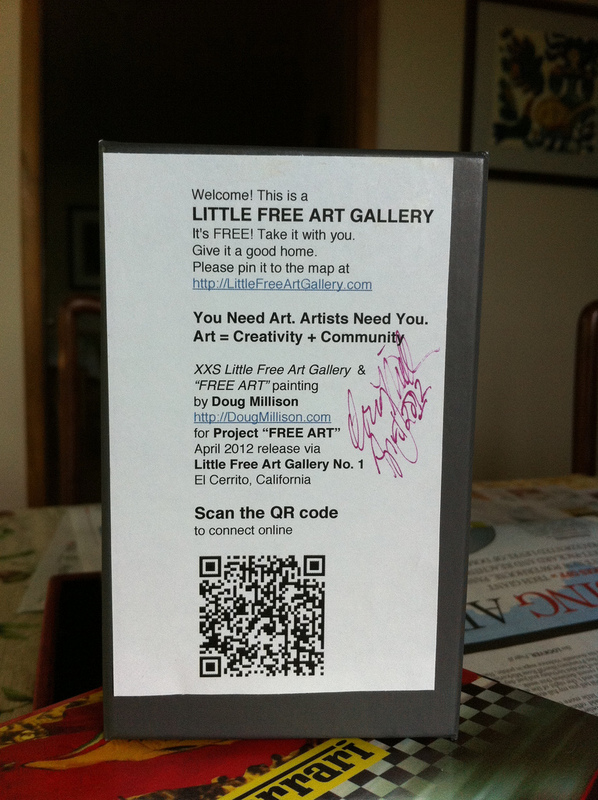 Later, recipient can pin the art work's location on the map at the Little Free Art Gallery web site. Why would artists who can sell their works want to give away an original art work for free? To take part in an innovative public art project that calls into question the value of an original work of art in a world where most people never purchase art and where they have grown accustomed to consuming large quantities of art and other media on the Internet, especially on Facebook and elsewhere in social media. Sales of participating artists’ art works and attendance at their art-related events will increase as more people connect with and get to know the artists in their midst, after this easy, non-intimidating introduction provided by the Little Free Art Gallery. The Little Free Art Gallery project relies on voluntary contributions of original art works, time, money, and other resources as it works to develop revenue streams that can sustain operations. Little Free Art Gallery project provides free downloads of plans and specifications that people can use to design and built their own Little Free Art Gallery kisoks. The project earns profit from the sales of a deluxe printed and color-illustrated version of Little Free Art Gallery kiosk plans & specifications. The project also earns a commission on the sale of Little Free Art Gallery kisoks designed and built by participating artists. Paid and in-kind sponsorship programs, display advertising (on the LFAG kiosks and online) and licensed merchandise featuring the LFAG logo generate revenues, too. Every studio, gallery, museum, retail location that sells art supplies and tool, schools, cafes, and other locations or organizations that serve artists and art lovers, can benefit from installing a Little Free Art Gallery. The Little Free Art Gallery Project is also an art work itself. Each Little Free Art Gallery box is an art object, designed by an artist, as well as the individual art works displayed within. The interaction between a person and a Little Free Art Gallery amounts to a conceptual art performance that can be scripted in advance to a certain degree, and which can be streamed to online audiences, and recorded for later viewing or other artistic use. I was thinking this could be a way to introduce the project publicly. After an initial network of permanent Little Free Art Gallery kiosks is installed (no matter how few nodes, more than 1 is a network! 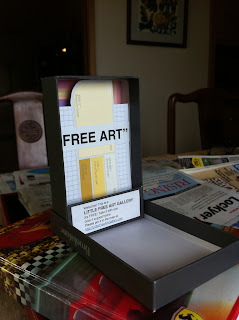 ), the participating artists could make some of these XXS Little Free Art Gallery boxes and put them out in public in locations where art lovers have a chance of encountering them. 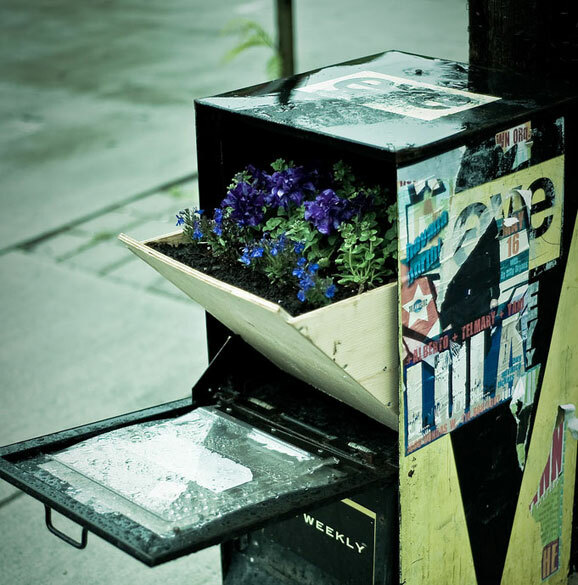 As such, making and placing these little boxes out and about, enters the sphere of outlaw street art. Photographs and videos of these XXS boxes and the process of installing them would be shared on the project blog as well as in social media (Flickr, Facebook, Twitter, Pinterest, Tumblr, etc.). 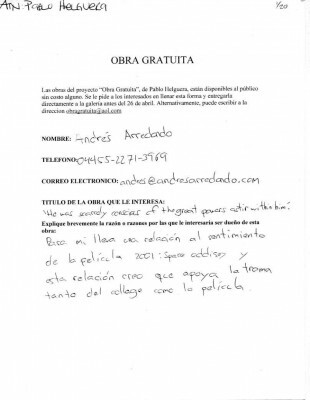 Plus an out-bound public relations effort to get news of the project to interested journalists and bloggers so they can in turn write about it for their audiences.